distribution Essentially statewide. Though absent from a handful of mountain and far eastern Coastal Plain counties, it likely occurs in essentially all 100 counties. abundance Fairly common in the mountains and Piedmont, but mostly uncommon in the Coastal Plain, and rare near the coast. flight The flight starts in April in all provinces, being a bit earlier in the Coastal Plain and Piedmont (early or mid-April) than in the mountains (late April). The long flight continues to mid-October (rarely to early November) in the Piedmont, at least to early October in the Coastal Plain, and to mid-September in the mountains. habitat Ponds and small lakes, as well as slow-moving streams, usually where there is emergent vegetation. 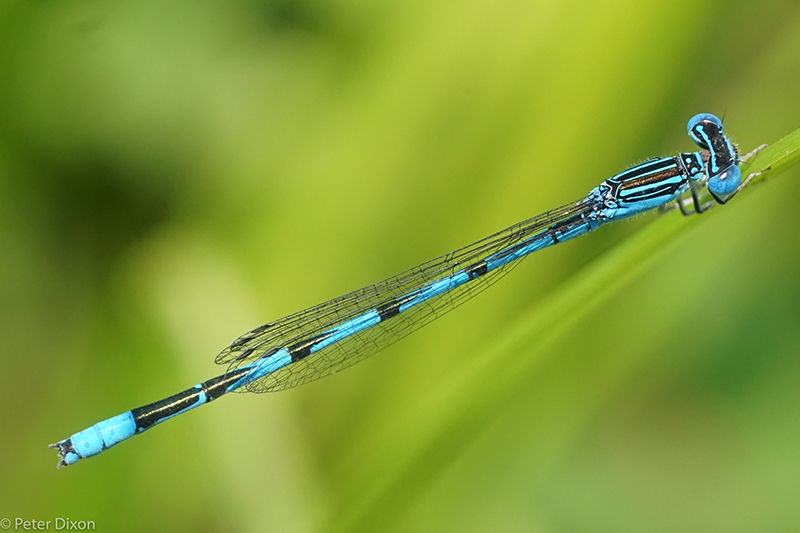 comments As with so many of our damselflies, the number of recent records with flight dates is far fewer than what would be expected from the large number of county records historically -- implying little effort at studying damselflies by more recent biologists. Though the species occurs perhaps in all 100 counties, it is not overly common anywhere, with just two single-day tallies of over 15 individuals.